SAD BRAVES KID: *sniff sniff* We were so close... *sniff* and it was all ripped from us. How will I ever *sniff* give my heart to anything again? SAD BRAVES KID kicks his Thrashers beanbag chair, then flops down on his back atop a queen size bed. The Pottery Barn ceiling fan dries his tears... or at least those that have already fallen. BULLHORN KID enters the room, carrying his favorite accessory. He sits on the bed and puts a comforting hand on SAD BRAVES KID's shoulder. BULLHORN KID: Hey, hey buddy. It's okay. Things are going to be alright. We've all been there. SAD BRAVES KID: *sniff* R-r-really? BULLHORN KID: No, not really. But just bear with me, Chipper- I'm trying to help here. In fact, back when the Phillies were losers just like the Braves, back when I was just a tiny infant with my baby bullhorn and we played in a football stadium, I think--it might have even been long before I was born, I don't remember it was so long ago-- but anyway, I would turn to poetry to help perk me up in sad times. SAD BRAVES KID: *sniff* Okay. I like poems! I read them when I have lattes. BULLHORN KID: Good story. Here, try this one on for size. SAD BRAVES KID: Wow, *sniff*, that was... really nice. Thanks for that. I guess Braves "fans" and Phillies fans can really co-exist and be pals in real life. Thanks, Bullhorn Kid, I'm really feeling a lot better now. I mean, there's always next year, right? BULLHORN KID: LOL, you stupidhead! Do you really think I'm being serious!? THE BRAVES STINKKKKKKK. CHIPPER JONES STINKS!!!!! LARRRRRRR-YYYYYYYY, LARRRRRRR-YYYYYYY. YOU GUYS F***ING STINK WORSE THAN A MAIN LINE BROTHEL ON A BANK HOLIDAY!!!! WOOOO, PHILLIES #1!!! YEAH BABBBB-YYYYYYY, WORLD SERIES OR BUST. HAVE FUN GOLFING, PUNKS! CHOP THAT, MCCAN'T! HEY, KID, NICE JOB BY YOUR BULLPEN LAST NIGHT, HAHAHAHAH. LOSERS!! THEY MUST BE ON OUR PAYROLL TOO, LIKE ED WADE. MY MOM LET ME STAY UP LATE TO WATCH IT AND EVERYTHING. CAN YOU BELIEVE THEY PUT YOUR FACE ON TV LIKE THAT? IT WAS MORE EMBARRASSING THAN PETER MOYLAN'S ACCENT. BULLHORN KID abruptly storms from the room in a haste, leaving total emotional destruction in his wake. SAD BRAVES KID bursts into tears, devastated. 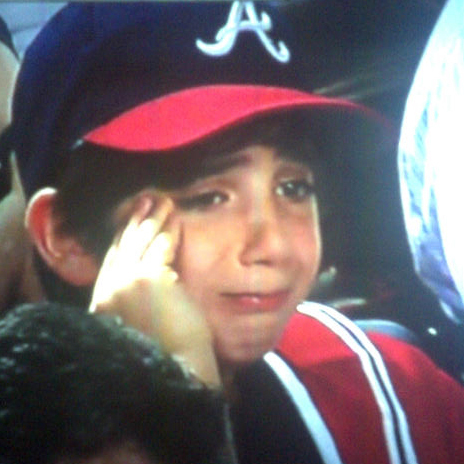 SAD BRAVES KID: *SNIFF*, MOMMMMMMYYYYYYYYYYYYYYYY. I don't like the Braves anymore! I want a Falcons jersey for Christmas! I should feel bad for him but I'm too busy wiping up the water I spit out on my computer as I was reading this. I live with a Braves fan and can't decide whether to rub this in his face or not. 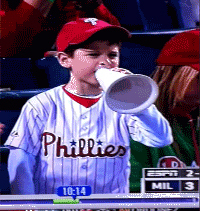 I mean, who doesn't love the Bullhorn Kid? SN: total gut-busting laughter in my office on this. Thank goodness the door was closed. Thrashers are no longer an NHL team, by the way :P they moved back to Winnipeg. I think 2nd Anonymous doesn't get the joke and also misspoke by saying they "moved back" to Winnipeg, as they were an expansion franchise who are now moving to Winnipeg, a city whose team moved and became the Phoenix Coyotes. I hope this little pre-pubscent douchebag is crying in deep in his soul. It bugs me that Bullhorn Kid's photograph is the wrong aspect ratio.